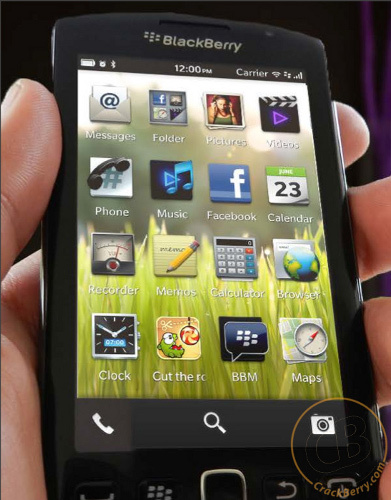 Looks like we are seeing aother glimpse of the much anticipated BB 10 OS. Although the device may look familiar, whats in the picture is something actually very refreshing. The photos are taken from what is said to be an external ad agency's marketing documents. 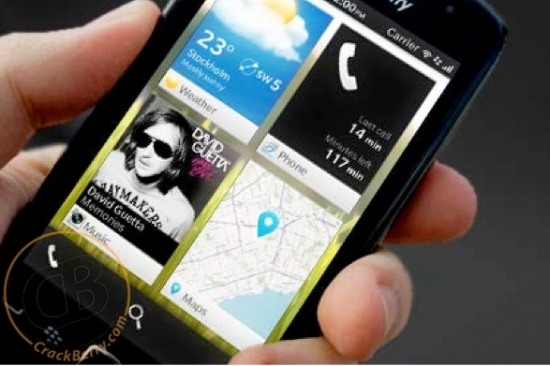 The pictures show what appears to be a QNX based OS running on the current Blackberry Torch 9860/9810 models. However, the odds are that we wont actually be seeing the BB 10 OS running on the current OS 7 devices. In addition, new homescreen widgets are shown. This gives us a nice little surprise that RIM may indeed be working on some widgets for us. As you can see there are quite a few similarities between the OS on this device and the QNX based OS that runs on the PlayBook. If you look closely you can see that the folder icon shows a preview of the contents inside much like the PlayBook OS 2.0 developer beta that we have now. Folder creation like that on a mobile device will be a really nice touch. The other nice thing about the picture above, is that it shows a fresh new user interface that actually invites the user to home screen instead of differing them to a menu button or a slide like action. In the picture below it shows what looks like a new in-call menu. In addition there is an icon labeled video chat. Could this mean that video chat will be an option with BB 10? Another interesting point to note about this picture is that it actually shows the carrier brand in the top corner. Does this mean that AT&T will be one of the first carriers to have available a BB 10 device? It's hard to say whether or not these images depict the final product, but it does leave us wanting more. The pictures seem to go from one extreme to another in regards to functionality, but do have some key features that coincide with previous rumors. As always with these types of pictures only time will tell the truth. In the meantime were still waiting. Last edited by ice2921; 02-13-2012 at 08:06 PM. I think they've got a winner, it's all up to the media now. Hopefully there's a proper mail app in there somewhere. I'm not to optimistic about these photos. I call BS. To expand, they all look like they have been photoshopped. Even the photo above in the middle, look how distorted and wavy the top edge of the device is. I'll say that these are most likely fakes. Even the icons look like crap. now that u mention it yea, there are a few graphical errors and oversights. might still be ok though, from what i read it wasn't real stuff, it was presentation material. I'm a pessimist when it comes to leaked photos. Unless it's crystal clear and gives us without a doubt proof, I won't believe it. People have already forgotten about the last leaked BBOS 10 image CB had leaked which had many issues as well. These types of images can be photoshopped very easily. So unless it's from RIM's mouth or it's very high res... grain of salt. Take for example the BBM icon. What the??? That looks horrible. Could be presentation mockups. But I even doubt that. No graphic designer for RIM is going to put out crap like this if they have any type of pride in what they do. Relax people, according to the article these are BB Torch 9850/60 and 9810 phones with the BB10 OS pasted on. This is pre-marketing material. RIM personnel clearly read the comments about everything Blackberry, they seem to be putting out snippets of info about BB10 in order to gauge public sentiment for the new phones and OS. I believe they'll make the necessary changes based heavily on what the DEFECTORS and NON BLACKBERRY fans want, since those are the people RIM need to impress. I'm sure that when BB10 finally launches it'll look totally different from what's being leaked now and it will be the most advanced, flexible and user friendly OS there is...PERIOD! !